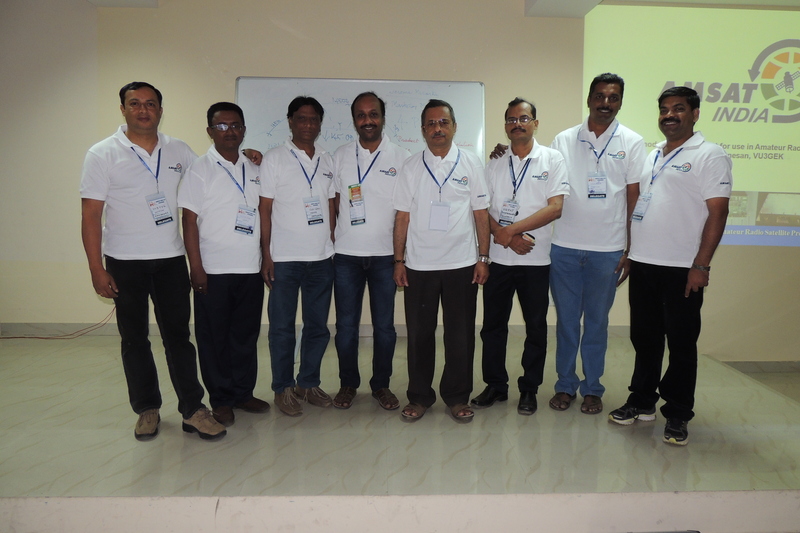 Core team members VU3TYG,VU2WMY,VU3GEK,VU2RVJ,VU3PZA,VU3HCJ,VU3JBA& VU2RMS,of AMSAT INDIA traveled to Hyderabad to attend HAMFEST INDIA 2014 on November 8th and 9th. Some members reached couple of days early to visit historic places in this city. AMSAT INDIA team was provided a slot for two hours on the first day of the event to talk about topics related to Amateur radio satellites. The inauguration of the event was quick and we moved to the seminar hall which was allocated to us for the presentations, the seminar hall was well organized and consisted of dual screen projection and a good audio system. The first presentation was covered by Nitin VU3TYG and Mani VU2WMY who provided an update about AMSAT INDIA and activities & an update on the end of mission of VO-52. An appeal was made for people to come forward and join the organization to help with the objectives of the organization. The Second presentation was done by Ravi VU2RVJ who spoke about “Working with LEO satellites” and covered topics related to LEO orbit’s, Antennas, Doppler Shift and basic setup required for such operation.Guru, VU2GUR also spoke about doppler shift and demonstrated this with the help of Mani VU2WMY by playing and varying the volume of an SSTV audio file and simulating the progress of a satellite pass. The third presentation was by Nitin, VU3TYG who presented about “Telemetry Decoding from Amateur Radio Satellites” and covered topics as introduction to Telemetry and Telecommand, why satellites have telemetry and what does the data mean, how to get started with a basic setup, examples on how to decode and educational outreach opportunities. The last presentation was by Nitin VU3TYG & Ganesan VU3GEK who provided an description of the new Multi Mode payload designed at AMSAT INDIA. Ganesan explained the various stages of this payload using the block diagram and how this can be customized as per mission requirements. The next HAMFEST will be held at Rajkot in 2015 and we will look forward to participate again.